Another new little one today. His name is Ebenezer (#2), he is 2 months old. His 18 year old mother tried to kill him so Social Welfare sent him to Neema Village. Hopefully she will get some help and someday he can go home. 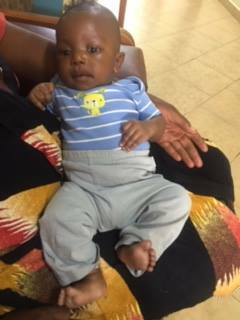 There are many new babies at Neema and we really need some sponsors to pray for these little ones and help us with their formula and nanny care. You can sponsor a baby and put his picture on your fridge to remember to pray for him and his mother.